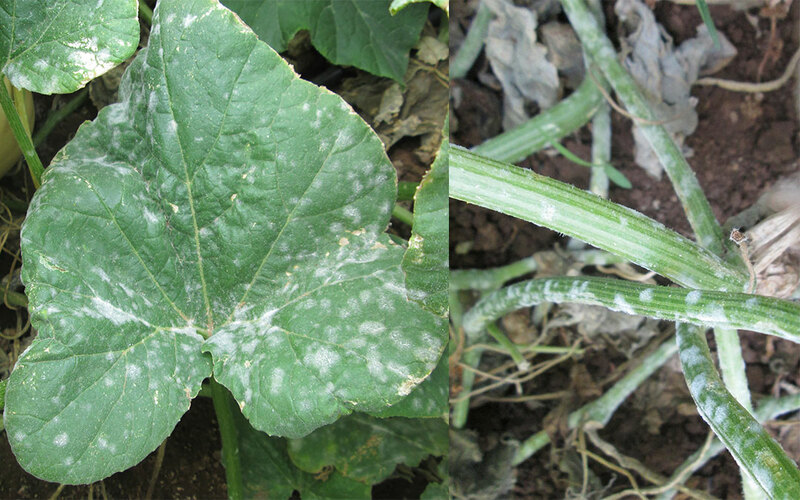 Powdery mildew is a fungal disease that can infect all cucurbit crops. The disease is found worldwide and can cause severe reductions in yield if not sprayed for preventatively. There are two pathogens that infect cucurbits, Podosphaera xanthii (ex Sphaerotheca fuligenea) and Golovinomyces cichoracearum (ex Erysiphe cichoracearum). These pathogens are obligate pathogens and survive on volunteer or weed host plants. Infection can occur between 10 and 32⁰C, but the optimum temperature for development is between 20 and 27⁰C. For infection to occur high humidity (50 – 90%) is needed, whereas for the spread of the disease, low humidity is required. Spores are windblown and can form germ tubes in as little as two hours after contact with the plant leaves. Spores can be formed within four days after infection, meaning the disease can spread rapidly when conditions are favourable. Symptoms of Powdery mildew can be seen as white powdery spots on the leaves and stems of the plant. Infection can occur on the upper and/or lower surfaces of the leaves. The infected leaves will eventually turn yellow and can become brown and papery. The fruits are normally not directly attacked by the fungi, however, the loss of foliage can severely affect yields, as well as causing the fruit to be exposed to the sun, resulting in sunburn and reduced fruit quality. Powdery mildew can be controlled by implementing a preventative fungicide spraying programme. 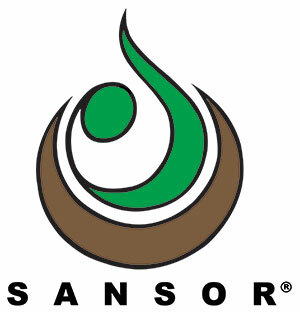 Weed control and good sanitation practices can also contribute in controlling the disease. By planting cucurbit varieties that have resistance to Powdery mildew is of course the best option for disease control. Sakata’s butternut range is well known for their resistance to Powdery Mildew, enabling the grower to save on spraying cost by not having to spray for the disease as often as on susceptible varieties. Sakata butternuts also obtain much higher yields due to the vigorous plants that stay healthier for much longer than susceptible varieties. Pluto is a medium size (1.0 – 1.5 kg) F1 hybrid butternut with excellent fruit quality. The plants are adaptable and vigorous and tend therefore to be less susceptible to diseases. Pluto has an outstanding yield potential and is well adapted for cooler season harvests where small to medium fruit are required. The firm, deep orange flesh has an excellent flavour and high sugar content. Mature fruit have an excellent shelf life. Fruit are used as traditional butternut; however the superior flesh quality makes Pluto suitable for processing and export. Pluto has intermediate resistance to Powdery mildew (Px) (ex Sf). Quantum F1 hybrid butternut is the slightly smaller (0.8 – 1.2 kg) sister line of Pluto with the same excellent fruit quality. Yield potential is excellent and the fruit are not inclined to crack. Fruit set is outstanding and covers a long bearing season. Plants are adaptable and vigorous and tend therefore to be less susceptible to diseases. Quantum is well adapted for warm season harvests where medium sized fruit are required. The fruit are suitable for the traditional butternut market, but because of the varieties’ superior flesh quality, Quantum can also be suitable for processing and export. Quantum has intermediate resistance to Powdery mildew (Px) (ex Sf). Veenas is a small to medium size (0.6 – 1.0 kg) F1 hybrid butternut with outstanding fruit quality and uniformity. Plants are widely adapted and yield potential is excellent. Fruit set is also excellent and covers a long bearing season. The flesh is very firm, yellow orange in colour and has a very good flavour. The rind is very smooth and tan in colour when mature. The mature fruit have an excellent shelf life. Veenas is well adapted for warm season harvests where small to medium sized fruit are required. Veenas has intermediate resistance to Powdery mildew (Px) (ex Sf). Cosmos F1 hybrid butternut produces fruit of medium size (0.8 – 1.2 kg). The bush type plants are vigorous and tend to be less susceptible to diseases. Yield potential is excellent for a bush type plant. Cosmos is well adapted for planting in spring. As fruit set is concentrated, fruit may be ready for harvest when supply to the market is limited. The advantage of the bush plant is that mechanical weed control is possible well into the season. Cosmos has intermediate resistance to Powdery mildew (Px) (ex Sf).